Eleven-year-old Alexis is growing up near Washington, D.C., in the years following WWII. The Cold War with the Russians is on lots of people's minds, but Alex and her brother Chuck are more interested in just one facet of the US/Russia conflict: the Space Race. Alex looks up to Chuck who, despite a propensity for doing things his own way (which occasionally involves disreputable behavior), fancies himself a student of everything related to one day going to space--radio, radar, rocketry, etc. Alex is fully involved in all of Chuck's adventures, and she strives to be an adventure-seeking woman like Amelia Earhart. Alex and Chuck's dream starts to seem more possible when Captain Ebbs moves in down the street. Alex befriends her, and Ebbs begins sharing her stories of flight, what is necessary to theoretically put humans in space, and the rocketry work of Dr. Wernher von Braun (remember him in October Sky?). Both Alex and Chuck befriend Ebbs, and although Ebbs is skeptical of Chuck's methods and his sometimes negative influence on his sister, she takes them both under her wing. Their adventures culminate in a boating trip down the Potomac with the possibility of seeing a secret military facility rocket launch when they reach their destination. It is during this trip that we see both the true potential and the sincere motivations of our characters. I really enjoyed the character of Alex--her thoughts and considerations about her family and the world around her ring true, and she is a believable young girl with a goal to get to space one day. Most of the other characters in the novel aren't quite as strongly sketched, but I don't think that fact detracts from the appeal that Alex and her adventures will have for young readers. 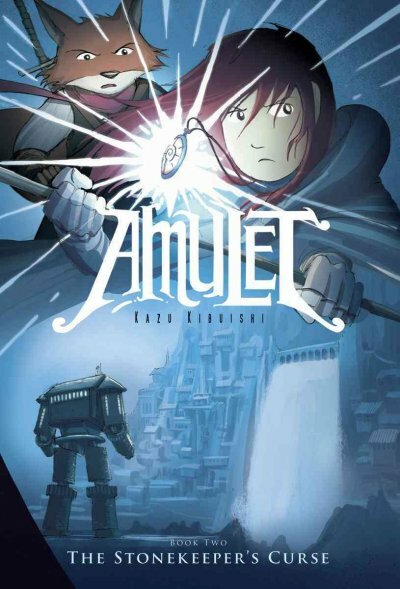 The plot could be more even-paced and the ending not quite so hastily tied together, but the story works and will likely hold the attention of its audience. This book also serves as a great addition to historical fiction set in the early Cold War--on numerous occasions Alex asserts that she wants to fly and go to space despite her mother's insistence that girls don't do those things. Seeing Alex strive to do what she loves despite her gender, as well as the strong female role model she finds in Ebbs, helps paint a picture for young readers of how gender norms were much more restricting than they likely experience today. I'll be recommending this book for readers third- through sixth-grade who are interested in historical fiction, space, and girls' adventure stories. 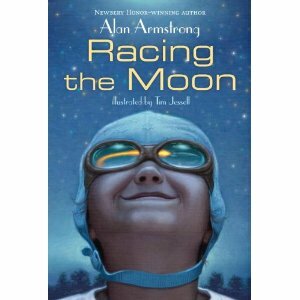 Racing the Moon will be released by Random House on June 26, 2012. 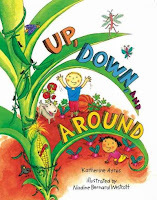 After she's caught running away to try to join the Ice Age Kids' Dig, future paleontologist Rebel McKenzie finds her summer plans turned entirely upside down. Her older sister Lynette is back in town toting her young son Rudy, and Rebel is sent to live with them for the summer--it's Rebel's job to look after Rudy while Lynette goes to beauty school. Rebel remains fixated on getting the money to go to the August Kids' Dig, and when she meets a bratty neighbor girl who brags about winning $500 in a beauty pageant, Rebel enters with her eyes on the prize. Rebel and Rudy also befriend a few of their kinder neighbors, including Lacey Jane, a girl Rebel's age who enters the pageant as well, and Miss Odenia, an older woman who offers to train the girls for the pageant in exchange for their serving at her card parties. Throughout the summer, Rebel uses her keen skills of observation (essential for any paleontologist) to notice some of the living things around her for a change: she develops a friendship with Lacey Jane, starts to understand her older sister, and begins to see Rudy as more than just a nuisance. Everything leads up to the pageant itself, when it's up to Rebel to take the stage and decide who she really is. I love Rebel's voice throughout this entire book. She is not always the most likable young girl which, in my opinion, makes for the perfect narrator for a book for pre-teen girls. Rebel struggles between going after what she wants with little concern for others--she thinks some mean thoughts at times--and realizing that the people around her might have wishes and goals that they care about just as much as she does her own. I loved seeing the feisty, whip-smart Rebel try to weave together her identities as goal-oriented future paleontologist (the Ice Age kind, not the dinosaur kind), defender of the downtrodden, and caring sister, aunt, and friend. Her evolution feels so true to what girls her age think and feel over the course of a few months, and it's always wonderful to see a strong female character come out on the other side just as strong as she starts out. I also really enjoyed the bits between the chapters in this book--including some excerpts from Rebel's "field notes" from the summer, pictures drawn by Rudy, and pages from Lynette's cosmetology textbook. These snippets into the lives of the characters make the story that much more rich. 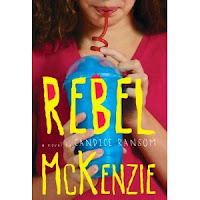 I'll be recommending Rebel McKenzie to girls in the third- through sixth-grade range, and I'll also promote it for a Mark Twain Readers Award when it is eligible to be a nominee. 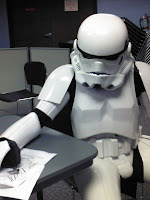 Rebel McKenzie will be released by Disney-Hyperion on June 26, 2012. The unusually warm weather of late has put me in mind of picnics and gardens, and I decided to offer some story times in the last few weeks on one of my favorite picnics/gardens themes: fruits and veggies! It's a topic every kiddo knows something about, and it has the potential to introduce some good vocabulary with different fruit/veggie names as well as shapes and colors when you look at pictures of each type of food. What's not to love about a big purple gorilla? 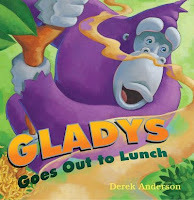 Gladys, who lives at the zoo, loves bananas. She could (and does) eat bananas morning, noon, and night. One day, however, she catches a whiff of some other food--and it smells delicious. 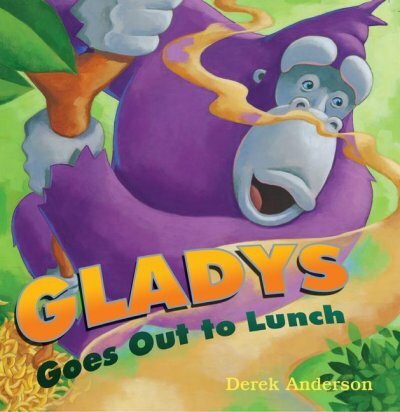 Gladys leaves the zoo in pursuit of the yummy smell, and despite trying several tasty foods along her journey, she almost can't find the one that smells so good. When she finally does, she discovers that it's twist on her favorite: banana bread! In this cute, simple tale with great illustrations, the story is told as though the readers/listeners are interacting with the little mouse on the pages of the book. The little mouse has located the perfect red, ripe strawberry, and the reader encourages him to save it from a big hungry bear who loves the fruit. 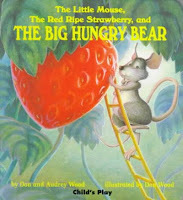 Poor mouse, he tries to hide, lock up, and disguise that giant berry before the reader suggests cutting it in two and eating it together. It's a great book with lots of opportunities for dialogic reading. Felt Board/Fingerplay: "Five Red Ripe Strawberries"
Five red ripe strawberries, sweet to the core. Four red ripe strawberries, sitting in a tree. Three red ripe strawberries, one for you and you and you. Two red ripe strawberries, shining in the sun. One red ripe strawberry, left all alone. 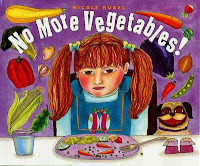 Ruthie asserts that she hates vegetables. She'll feed them to her dog, hide them... she'll do pretty much anything to make sure she doesn't have to eat them. Like a lot of young children, she refuses to even try them--she just knows she won't like them. After she begins helping to plant and tend a vegetable garden, however, Ruthie starts to see these foods in a different way. 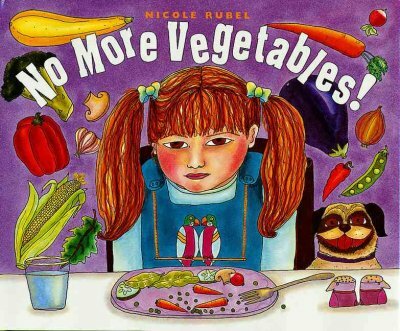 She succumbs to eating a grape tomato when she is overcome with hunger in the garden, and suddenly Ruthie realizes that vegetables are actually pretty good. This peppy song is a fruit-filled take on the hokey-pokey. 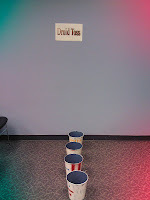 Kids get to put their hands in, shake, jump, twirl, and have all sorts of dancing fun. It feels so good to move around after those several books! I let the kids stay standing from our dancing for this story, as it has lots of opportunity for movement. The kids in the book work together to plant and take care of a garden, and the words and illustrations introduce all sorts of vegetables (and a few fruits!) with mentions of whether they grow up, down, or around. I have the kiddos use their hands to move however the text says, and they enjoy pretending to be corn, carrots, and other yummy things. Mmm, Mmm! It tastes so good! We had a "craft picnic" (a.k.a. we did the craft sitting on the story time rug) where every kiddo got a piece of yarn with tape on the end for easier stringing of fruit-colored cereals. I mentioned to caregivers the options of asking color names as the child strung each O on the yarn, or for older ones, encouraging a pattern of colors. While dropped and stepped-on pieces did make this craft a bit messy, it comes with a built-in system for telling when everyone is finished: they stop stringing the Os and start eating them instead! 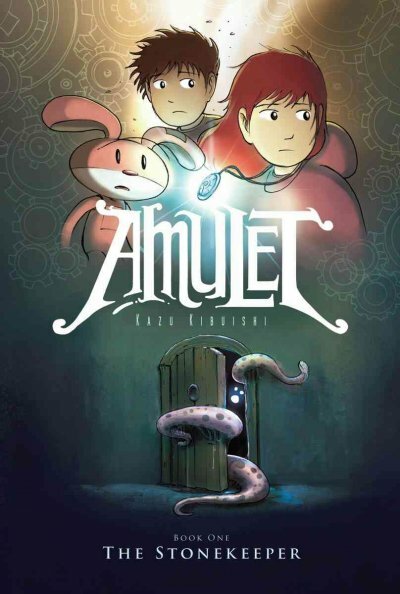 There have been four graphic novels released thus far in Kazu Kibuishi's Amulet series--the fifth is expected in Septebmer of this year. At the recommendation of a teacher friend, I picked these books from the juvenile graphic novel shelves at my branch. He was right, I was in for a good story and some really lovely art. The adventures of Emily, Navin, and the friends they meet are not at all limited to saving the children's mother; it would seem the wearer of the amulet--a stonekeeper--is destined for greater battles in this land of Alledia. 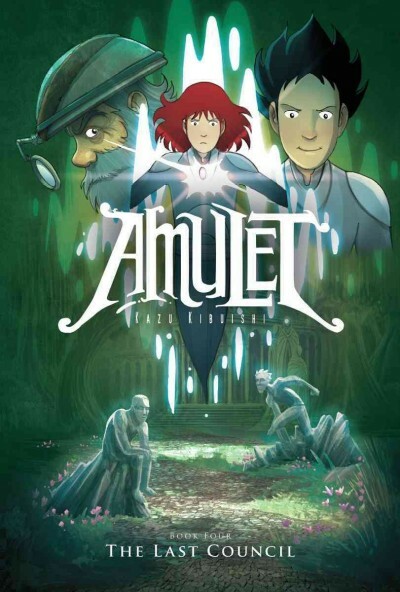 These first four volumes are filled with action, intrigue, bravery, sacrifice, and suspense enough to really captivate all readers, even those who are initially drawn only to the bright, engaging illustrations. 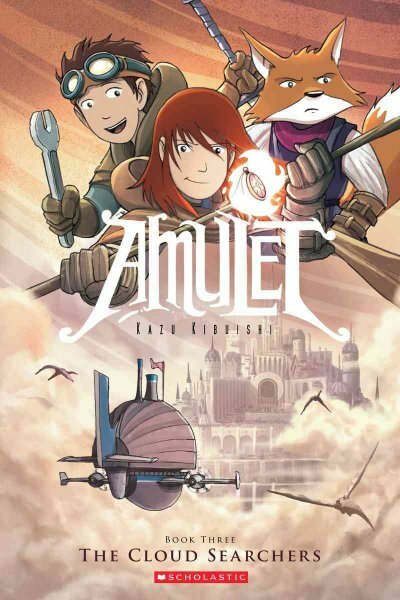 I'll be recommending this series for readers third grade and up who are interested in stories of adventure, fantasy, and the power in every child. Recommended for reluctant readers as well. What better way is there to celebrate being off of school and on spring break than making slime at the library? 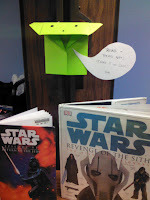 I asked myself this question while developing my library's spring programming schedule, and I decided that our branch was absolutely going to get slimed. The Slime Science program involved around 25 school-age kiddos out on the library's patio--by all means, do this program outdoors, as it is MESSY! Once everyone had gotten settled onto their sit-upon cushions, I showed them how to make our slime: I mixed about three cups of corn starch in a clear tub with approximately two cups of water. It takes a good five-ish minutes to stir these ingredients together into a slime, and I took that time to chat with everyone about states of matter. The kiddos were quick to name solids, liquids, and gases, and they had good examples of each and were able to mention some of their properties (good job, science teachers!). 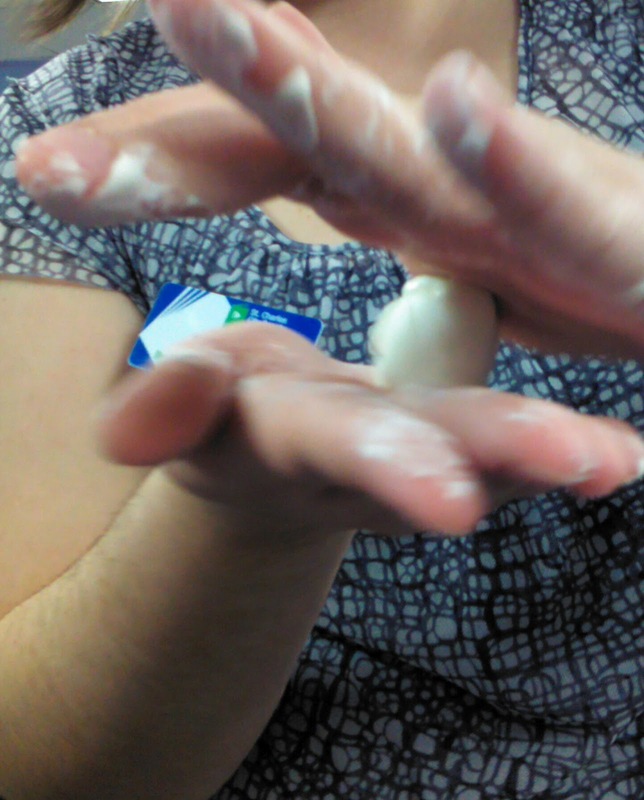 As my slime began to reach completion, I asked everyone if they thought a substance could act like two different types of matter. This question certainly piqued their interest, and I introduced the concept of non-Newtonian fluids--in this case, a substance that acts like both a solid and a liquid. This slime acts like a solid when pressure is applied to it (e.g., if you try to squish it or shape it, it resists changing its shape), but it will flow and drip like a liquid when left alone. They loved learning this term; I'm a firm believer in not trying to simplify language for children. At this point I invited the kiddos to come up to the tub of slime in small groups to touch it and see it for themselves. A great demonstration pattern was to invite them to slowly dip a finger in the slime; it feels like a slightly thick water. I would then tell them to try to yank the finger out quickly; at this sudden application of force, the slime resists and the finger doesn't slide right out. 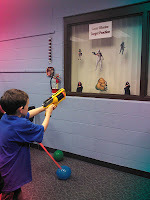 The looks of fascination and excitement on the kiddos' faces when they experienced this phenomenon for themselves were great. 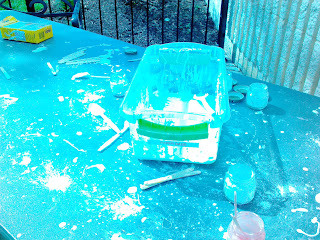 After we had cycled everyone through the demonstration tub, it was time for us all to make our own slime. I had prepared baby food jars of corn starch for all of the participants, and with the help of a colleague and a teen volunteer, every program participant added some food coloring and water to their jars. They each went back to their sit-upons to stir their mixtures with a popsicle stick until the right consistency was reached. I had anticipated needing more corn starch to balance the overly watery batches of slime, and it was a good thing I had--at least half of the kiddos needed to add more corn starch to their jars to get good slime. 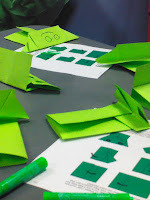 This bit of trial and error gave us great opportunities to talk about science and experimentation, and it helped pass the bit of time it took to get everyone's slime ready. We spent the last bit of the program pouring our slimes into our hands and playing with its solid-and-liquid properties. 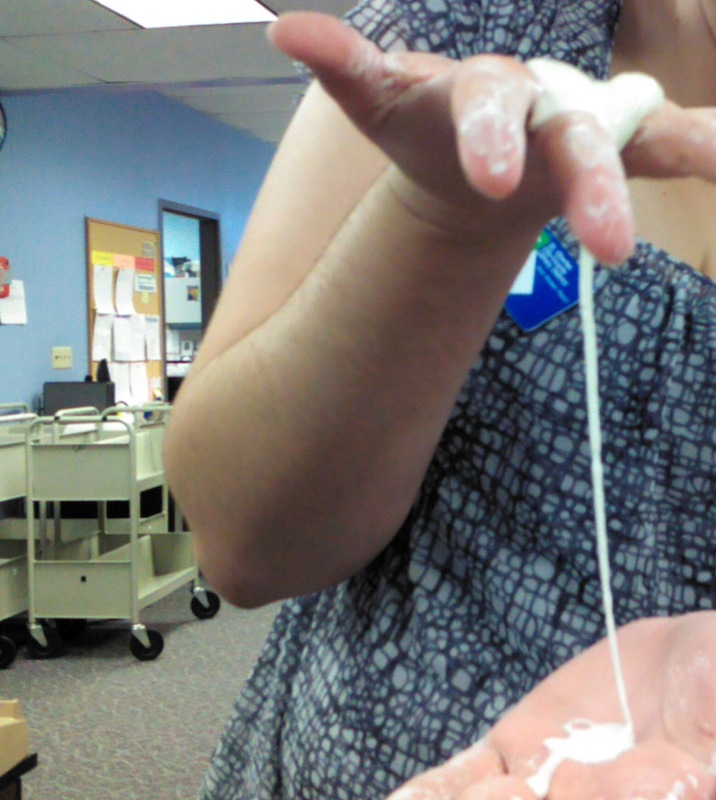 Some of the kiddos said it was gross; some said it seemed impossible how the slime could be both runny and firm; and some said they couldn't wait to share the experiment with siblings and parents at home. Everyone got to take home their jars of slime--each jar affixed with a label warning not to put it down the drain. 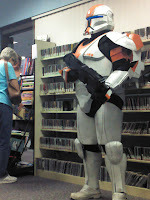 My library colleagues mentioned they heard all sorts of excited and positive comments about the program as kiddos and their families made their way out of the library. Educational and fun! 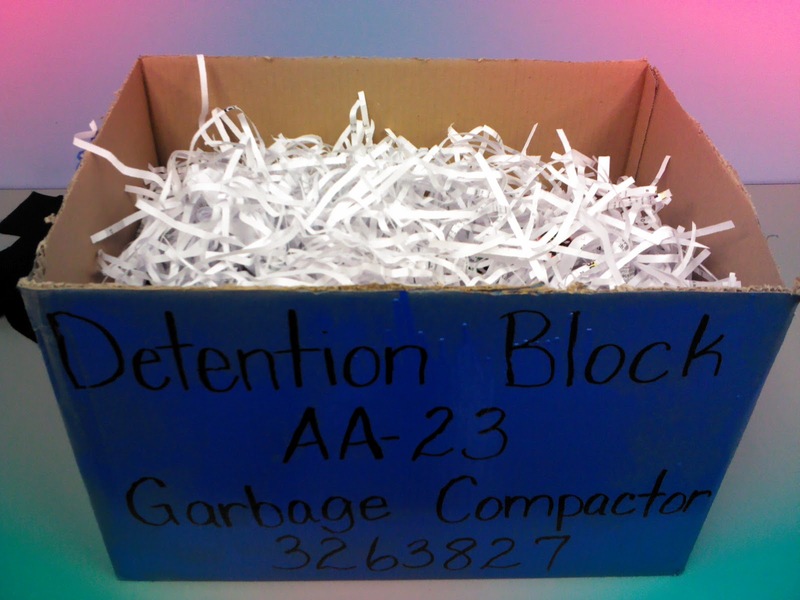 One of the best parts of this program is how easy and inexpensive it is. If you regularly collect baby food jars from coworkers, the only real costs are corn starch and food coloring. As far as prep for the program was concerned, I did spend a bit of time getting the individual jars ready with labels and corn starch. Other than that, all of the work was during the program helping everyone to get a good-consistency slime. Oh, and cleaning up did take a bit of time. 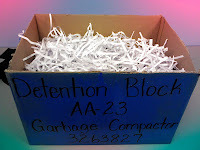 I did mention this program was messy, right? While I do quite a few preschool/day care outreach story times every month, in the springtime I visit even more of these locations than usual. I love getting to reach an audience of kiddos who might only hear a library story time once or twice a year. 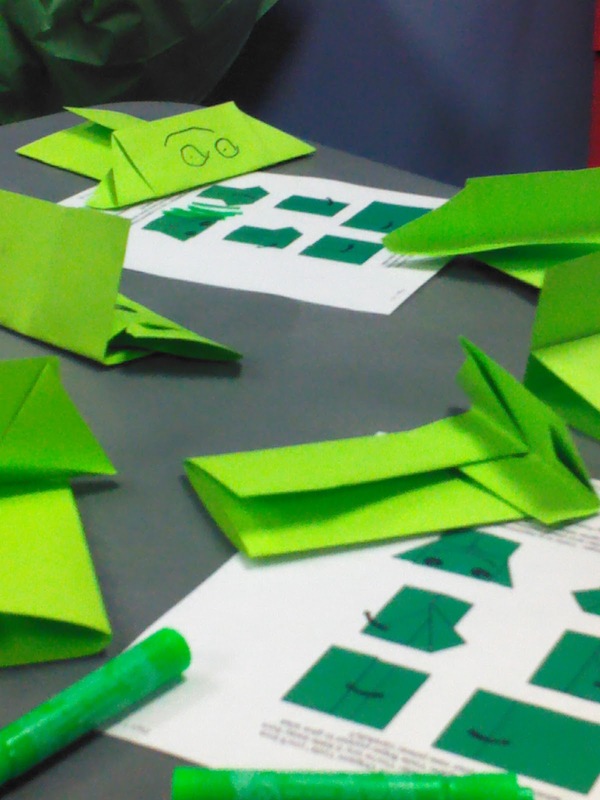 And while visiting so many locations might seem daunting as far a planning is concerned, I usually plan one awesome and adaptable story time that I can use throughout March, April, and May as I visit these one-time outreach groups. Sure, I end up reading the same books a lot--but that's why I choose to forego a theme and instead share some of my favorites! I use this opening song for all of my preschool story times. I've enjoyed seeing the groups I visit frequently learn the song--they know that it signals story time is about to start. With groups I'm visiting for the first time, it's a quick way to get kids' wiggles out before settling into the first story. 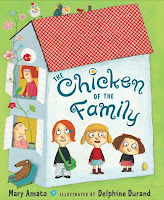 I think Jan Thomas can do no wrong when it comes to quick, goofy, engaging stories for pre-readers of almost any age. I preface this book by saying that the story is kind of silly--and the kiddos immediately begin giggling. 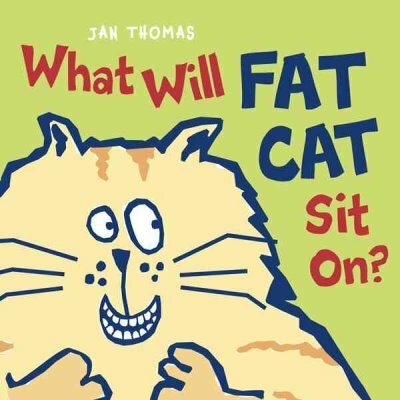 The whole narration consists questions about what Fat Cat should sit on (The cow? No! The chicken? No! Etc. ), and kids love the great illustrations and the zany idea of a fat cat sitting on a pig. 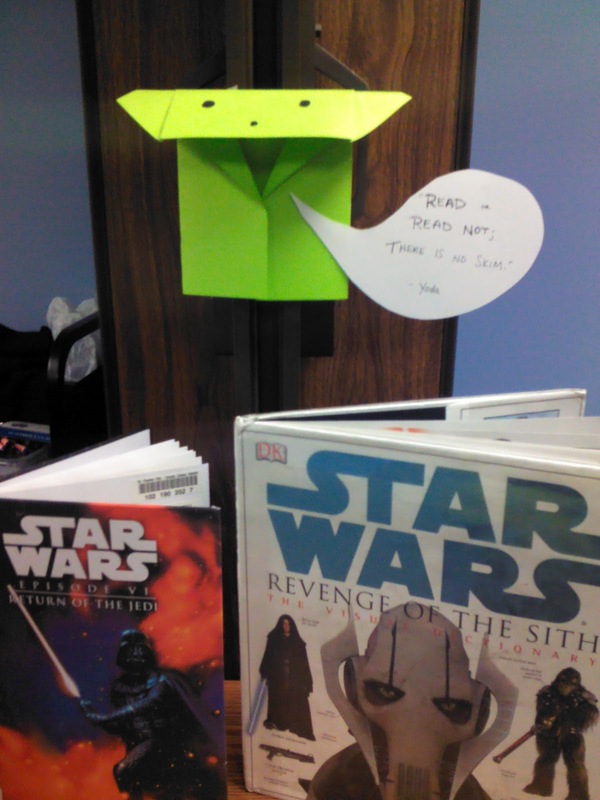 Simple and guaranteed to start the story time off right! 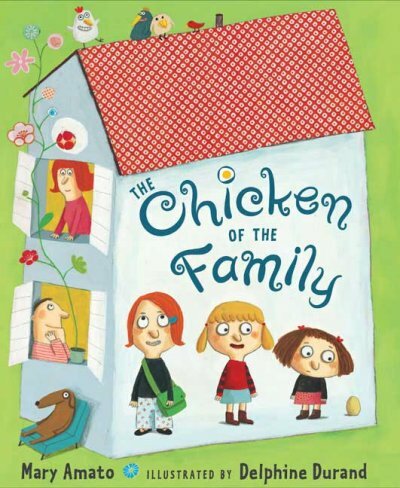 For slightly older kids, I'll read Amato's The Chicken of the Family, a story about young Henrietta and her two older sisters who tease her about being a chicken. It's a longer story, but it has really held the attentions of four- and five-year-olds. After all, what preschool hasn't experienced a bit of teasing at the hands of an older relative? For younger kids, I'll read the newer Stop Snoring, Bernard! by Ohora. 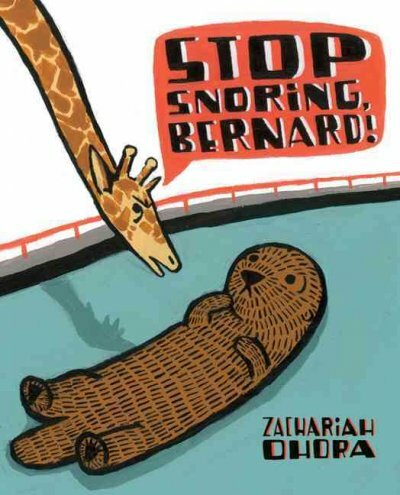 Poor Bernard, he really wants to get along with all his zoo friends, but his loud snoring drives them all batty. This is a great story about why being nice to your friends is important. As an intro to my next story, which features a parrot, I changed the birds in this simple fingerplay from blackbirds to parrots. Sometimes I have the kiddos just mirror my actions, sometimes I repeat twice so they can learn the words, too. This is definitely one of my favorite stories. A grumpy old man named Eugene expects the worst in every situation: when he wins a trip to Bermuda, he's sure he'll get sunburned; when he floats to a deserted island after his cruise ship crashes, he's convinced he'll be eaten by cannibals. (Note: I love when a preschooler then asks, "What's a cannibal?" They think the idea of a person who eats people is utterly ridiculous.) In actuality, he finds he's alone on this island with a parrot who, while he cannot fly because of a busted wing, does happen to know how to build a boat. 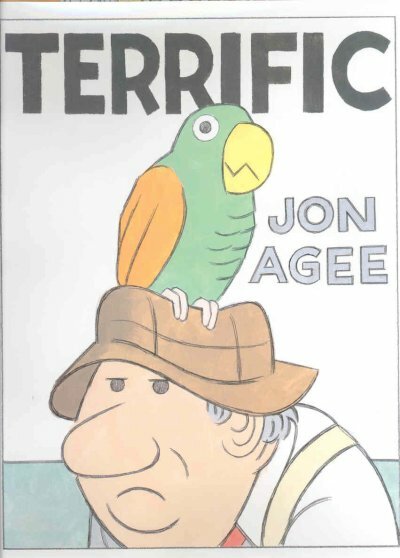 This is a great story of friendship and a positive attitude, and it also introduces kids to the word "terrific" and, for the oldest ones, the concept of sarcasm. 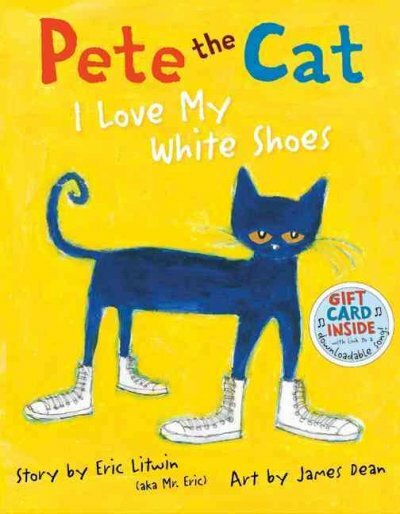 This first picture book featuring Pete the Cat was overwhelmingly voted the best read-aloud picture book by Missouri preschoolers and kindergarteners last year. It's been a mainstay of my preschool story times--in fact, I still bring it to a number of the locations I visit monthly because they usually beg me to read it again. It's a great story about a cat who loves his white shoes so much he creates a song about them. And when he steps in messy things and his shoes change colors? He just adapts the words to his song! The kiddos are always excited to shout out the color Pete's shoes have changed, and they love singing his song with him. I don't mind rereading this one--by the third or fourth time they hear it, the kiddos are "reading" it right along with me! I bring Al, my alligator puppet, to help sing a few verses of this camp song. 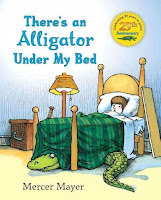 I explain that Al is going to say the world "alligator," and it is the children's job to repeat it back to him. If he says it normally, they say it normally; if he says it quietly; they say it quietly; if he says it silly, they say it silly. They love getting to be goofy and loud with their voices at this point in story time, and they think Al is just hilarious when he pretends to be my shoe or my belt. Mercer Mayer has written so many classics that translate really well to preschool story times. 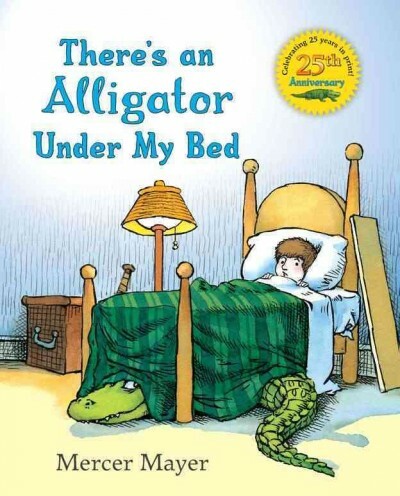 I love reading this story of a boy who schemes to get a good night's sleep by getting rid of the alligator living under his bed. This story is an exciting, quick tale that simultaneously quells fears of what lives under your bed and touts the ingenious problem-solving abilities of young kids. The artwork and page turns make for a great, suspenseful story, and its lightheartedly ominous ending always leaves kids smiling. "Clap, Clap, Clap Your Hands!" Depending on just how much time I've got left at the end of my story times, I'll either close with "If You're Happy and You Know It" or this song, which lends itself to being extended as necessary. My kiddos always appreciate the chance to wiggle and make noise by the time we're finished with all our stories, and ending with everyone waving goodbye is a seamless way for me to make my exit. Until next time, that is! Wonder, a novel by R. J. Palacio, tells the story of August Pullman who, after having been homeschooled all his life, is just beginning the fifth grade at a New York school. Fifth grade at this school marks the beginning of middle school, a transition that could be tough for any kid. Right from the start, though, August lets the reader know why starting middle school might be just a bit tougher for him: he was born with severe facial abnormalities, and despite numerous reconstructive surgeries, he still looks different. Noticeably different. He says he's grown used to the shocked and horrified looks of passers-by on the street, but he's not sure he's ready to face his peers at school day after day after day. This story is primarily about August and his first year of middle school, but Palacio makes it so much deeper by rotating the narrators throughout the story. We start off seeing this year of change from August's perspective, then from his sister Via's perspective as she begins high school at a school where almost no one knows about her family "situation." We also get to see this year from the point of view of Summer, a girl who befriends August on the first day of school through the simple act of sitting with him at lunch, and of Jack, a boy who begins the school year feeling obligated to be August's friend. These different narrators show quite clearly that, while August's struggles might be more obvious than most, no kid in middle or high school is really playing with a full deck of cards. You might seem popular but be hiding a painful divorce at home; you might feel like the token "poor kid" at your school; you might feel completely unsupported at home and thus wholly unsure of yourself. Palacio does a magnificent job of telling a beautiful story while also highlighting the theme that no one feels fully secure in his- or herself--and in that we are all very, very alike, no matter how different we may seem. I'd be surprised if Wonder isn't a major Newbery contender for this year, and I'll be recommending it for fourth-grade-and-up readers looking for a great book or to supplement their reading of the state award-nominated titles. Highly recommended. Didn't you just love science when you were a kid? Miss Frizzle and her Magic School Bus gang always had the most wonderful, quietly-educational adventures; Bill Nye made everything about science seem cool and understandable; and, frankly, the possibility of something blowing up or doing something similarly awesome seemed omnipresent. Science rocked. That's why I offer regular science programming at my library. 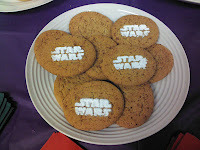 On a recent evening, about 20 school-age kiddos came to my library for a Food Science program. I had set up our program room with three distinct stations: the "appetizer" taste test station; the "entree" heat station; and the "dessert" cold station. 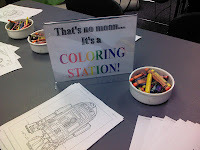 These stations were on the peripheries of the room, and kids sat on sit-upons in the middle. I opened the program talking a bit about the science of taste--tastes buds, four flavors (salty, sweet, bitter, sour), etc. Everyone in the room received a map of the human tongue with blank lines pointing at each of the four main taste hubs, then they crowded around the testing station. 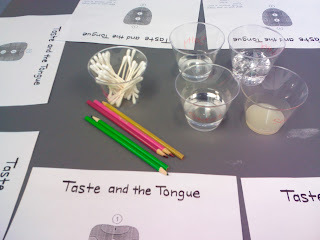 I had set up four testing groups, each with salty (salt water), sweet (sugar water), bitter (tonic water), and sour (lemon juice) solutions and plenty of q-tips for dipping and applying to the tongue. (I emphasized very strongly that each taste needed to be done with a fresh, clean q-tip; I didn't observe any double-dipping.) The kids pressed each solution-soaked q-tip to the four areas of their tongues with the goal of identifying which area is most sensative to which taste. I've never seen so many kids make sour-puss faces at the same time! After we had gone over the official tongue taste map, we moved along to talking about heat. 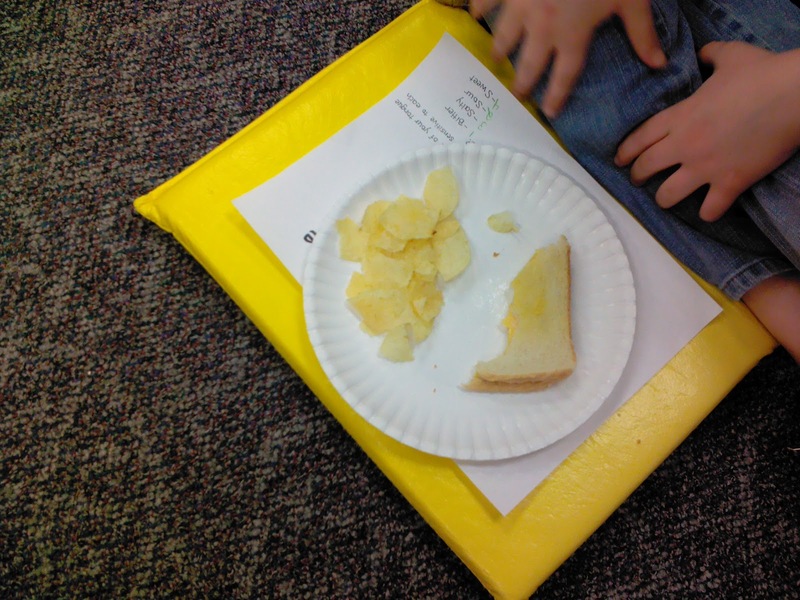 We talked about evaporation and heat with the assistance of a potato and potato chips, and then we talked about melting using the glory that is an ironed cheese sandwich. 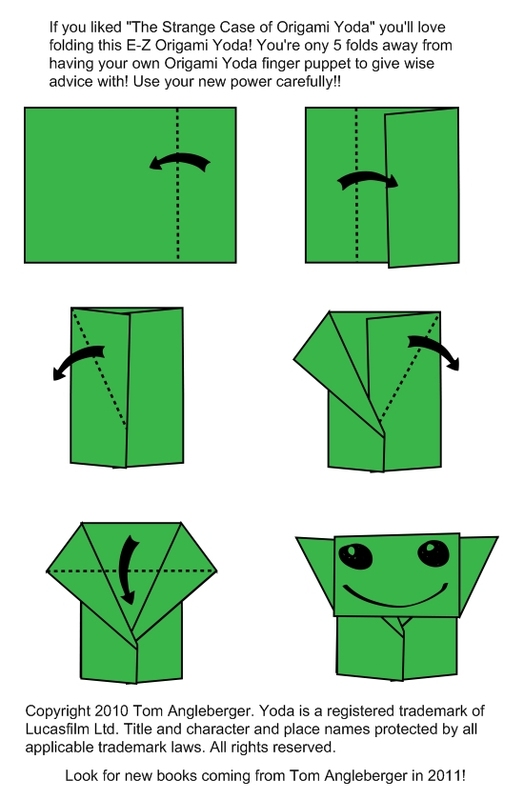 The kiddos thought it was crazy perfection to wrap a cheese sandwich in foil; iron the packet with a hot clothes iron (no steam function! ); and then enjoy a gooey-centered ironed cheese sandwich. (Note: If you want to use this activity in your library, pre-iron all but the example sandwich before the program and then just briefly reheat--otherwise the process takes too long.) We then took about ten minutes to enjoy our ironed cheese sandwich and potato chips dinner while talking about our favorite science topics. Dessert is the epitome of saving the best for last, is it not? We talked about cold and the process of freezing, and then I wheeled out the last activity: ice cream in a bag. We used this activity frequently at the summer camp where I counseled, and I'm happy to say that, though messy, it translated well to a library food science program. Every kid got a baggy of a milk, vanilla, and sugar mixture, and then found a shaking buddy to share the task of shaking a bag filled with salted ice and the sealed mixtures. 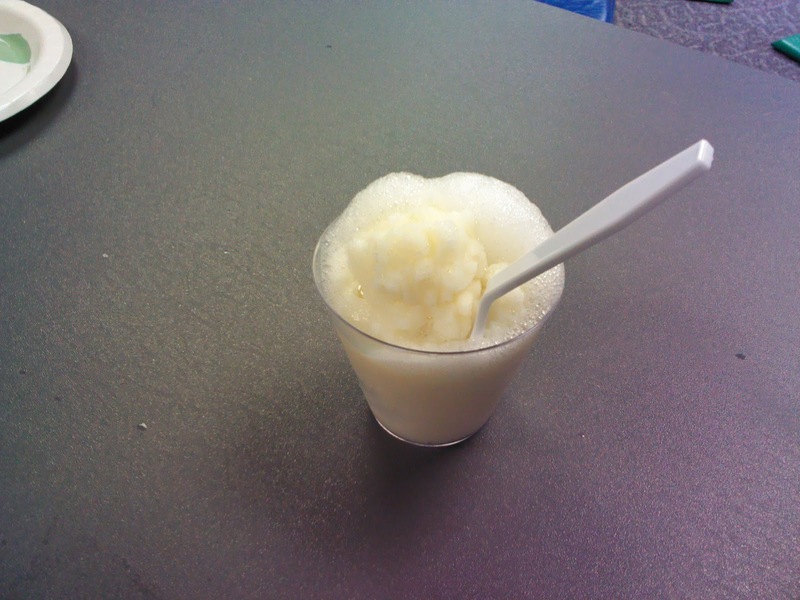 Some of the ice creams turned out icier or more frozen than others, but even the kids who ended up drinking their mixtures said they enjoyed the experiment. The failed tests were a great opportunity for further talking about temperature, too. In addition to having books with food science experiments available for the kiddos to check out as they left, I had two handouts they could take with them: one with the recipes from the program, and another with a Coloring with Foods activity from the American Chemical Society. And while I was in the program room cleaning up for a solid half hour after the program let out, my coworkers assured me that they heard nothing put positive comments from kids and their families as they checked out. 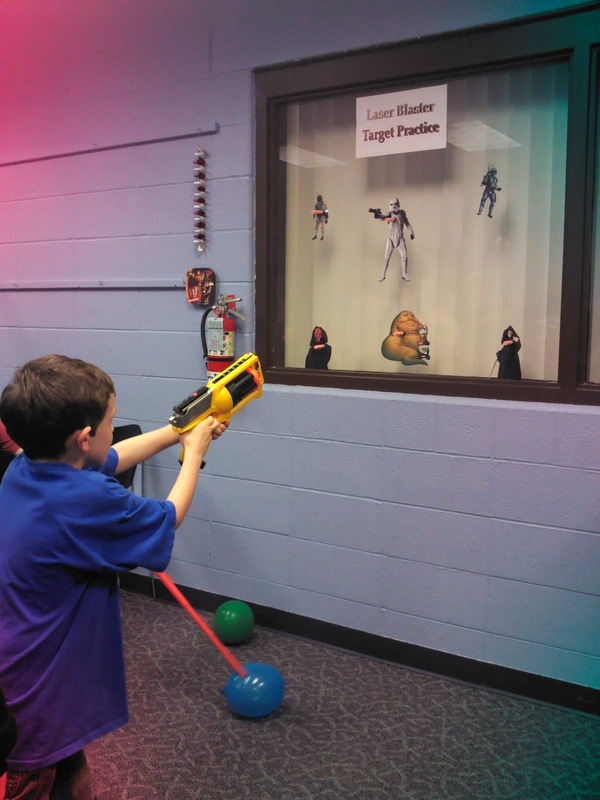 Science programming in the library: a fun, fascinating, and often zany experience for everyone! Welcome to Children's Librarianship in the Show Me State! My name is Amy, and at the end of the summer of 2011, I landed my first professional librarian job and moved from Indiana to Missouri. In the seven months that I've been the children's librarian at my mid-size branch library, I've gotten to read some fantastic books; meet some inspiring young readers; network and swap ideas with colleagues; and offer some tremendous programs for children of all ages. 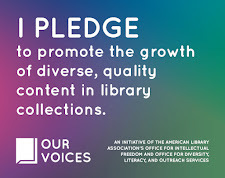 Now that I've gotten into the basic rhythm of everything my job entails, I figure it's time I start sharing my adventures in reading, programming, and advocating for young people. 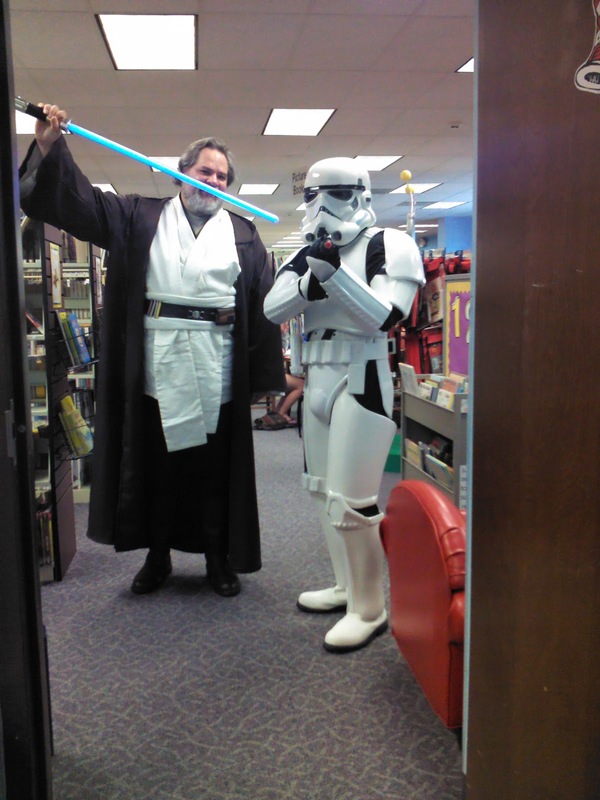 These are the voyages of a children's librarian in the Show Me State.